Yes, bomb is a technical term in meteorology. In a general sense it is a rapidly-strengthening extra-tropical storm (the common low pressure disturbances that regularly spread rain, snow wind etc across the mid latitudes), and as the name implies, with the capacity to do damage, usually via wind. Also implied is the element of surprise. To qualify as a bomb the central pressure must drop by 24 millibars in 24 hours. 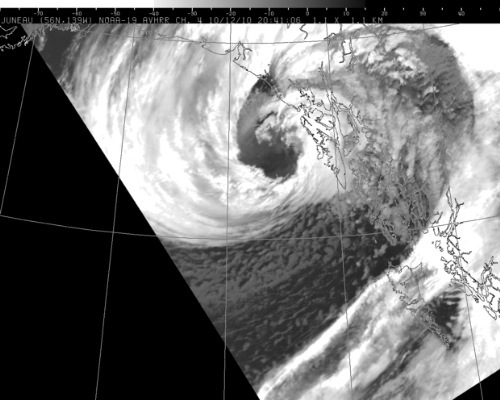 Our specimen is a low that made landfall in Southeast Alaska last week (10/12/2010). Lets see if it fits the general or technical criteria. This infrared satellite image ought to at least suggest to the layman, and convince anyone with meteorological training that this was a powerful, well formed, yes, even beautiful storm. The spiraling frontal band wraps 1-1/2 times around a tight-looking low center a little northwest of Sitka. This photo does not tell us much about its life story, though, and we’re wanting to know if this storm is of the fast hitting variety. For that let’s look at the surface chart (click for a larger version): The first one is from 4pm ADT on Monday the 11th. The low in question is labeled 1000 (millibars or mb for short). Its the one in the lower right part of the frame which happens to be straight west of Seattle and straight south of Anchorage, but is not aimed at either metropolis, but at the sparsely populated panhandle of Alaska. At 4am the low has dropped to 976 mb. That’s a total deepening of the requisite 24 mb, accomplished in not 24 but 12 hours! The rapid deepening along with the fast movement of this storm meant that any mariner or landlubber in its path had rapid and major weather changes to deal with. It is a testament to the science that this storm was well forecast far enough in advance that mariners could seek shelter and landlubbers could make provisions. That might not have been the case 20 years ago. Metlakatla: peak wind 55 mph. 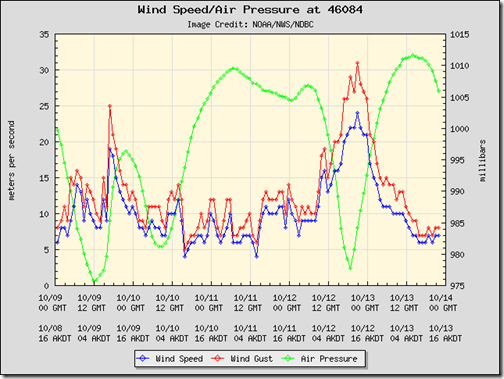 Ketchikan: peak wind 60 mph, and around 2 inches of rain. Hydaburg: peak wind 70 mph. Port Alexander: peak wind 69 mph. Little Port Walter: 2.85 inches rain in 24 hrs. Hoonah: 2.55 inches rain in 24 hrs. Juneau: peak wind 68 mph; power knocked out in some areas due to trees on power lines. Pelican: peak wind 71 measured by the Pelican Elementary School station, plus 4.46 inches of rain in the 24 hrs up to 8 am on the 13th (a record for that date but by no means for the the month or year). Skagway: peak wind 54 mph. Coastal marine observation stations are automated weather stations (for reasons which will become obvious) placed at locations pertinent to marine interests. Usually they have a much higher wind exposure than inhabited places—in some cases they are in locations with highly accelerated winds due to channeling by terrain. Here are some of the more extreme examples out of the SE AK marine obs. These kind of winds are not all that uncommon at these stations. 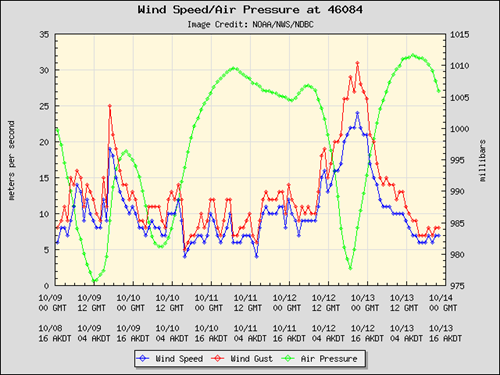 Cape Decision: peak wind 74 kts. Sisters Island: peak wind 67 kts. Cape Spencer: peak wind 86 kts. Eldred Rock: peak wind 64 kts. Lincoln Rock: Winds hit 87 kts then the wind speed went missing for seven hours, coming back online after the height of the storm. If you are interested in seeing where these coastal stations are located, or getting the data for them, visit the National Data Buoy Center’s excellent web site at http://www.ndbc.noaa.gov/maps/Alaska.shtml. I’d love to hear any first hand accounts of this storm (mariners and landlubbers welcome). Use the comment form for that or any questions, or suggestions for topics to cover. I’m still working on an outlook for coming winter and hope to post it next week.